CRI Online (Journalists in the UK Zhang Zhe): As the Olympic Games is drawing to a close, the Chinese sports delegation has won 80 total medals and 37 gold, ranking the second on the medal table. The Chinese Embassy hosted a special victory party on the evening (local time) of August 9. At that night the "China House"set up in London by the Chinese Olympic Committee created with a warm and joyous atmosphere. Representatives of Chinese companies, the Chinese community and Chinese students in London gathered there to celebrate the victory of the Chinese sports delegation. 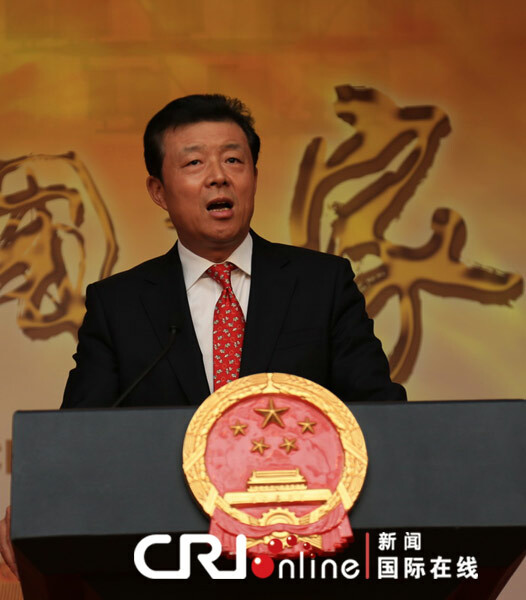 Chinese Ambassador Liu Xiaoming delivered a speech. He said that in the Olympic Games the Chinese athletes not only displayed true sportsmanship and Olympic spirit but also built friendship with other competitors: "All of you displayed true sportsmanship and Olympic spirit. Chinese athletes gritted their teeth and stiffened their sinews to fulfill the Olympic motto of faster, higher and stronger. The way you handled the intense spotlight and pressure is also what I greatly admired. You built friendships with other competitors. While competing aggressively, Chinese athletes also learnt from their opponents and congratulated them on their success. This attitude really showed the warmth and values of the Olympic family. The Olympics are also a stage for multilateral diplomacy. Everyone of you is an envoy of friendship. You are the assets and resources of China to enhance the reputation and appeal of our country; in turn this builds Chinese influence globally. " 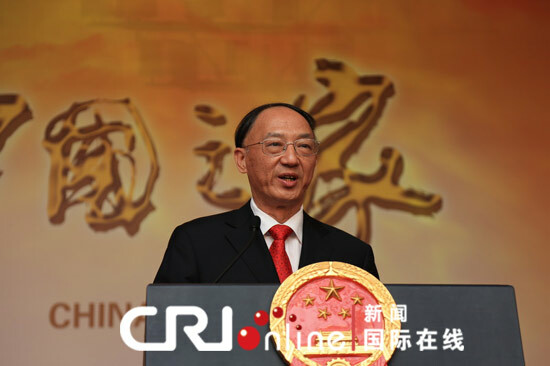 Mr. Liu Peng, President of Chinese Olympic Committee and head of the Chinese sports delegation, delivered a speech. He said that the Chinese sports delegation for the London Olympics received cordial encouragement from the CPC Central Committee and the State Council and warm support and care from the Chinese Embassy, the Chinese-funded institutions in Britain, the Chinese community and the overseas students. These are great incentives for the athletes to have good performance. "These achievements are inseparable from China's rapid economic and social development in the past more than 30 years since the reform and opening up, inseparable from the strong support of all the Chinese people and the whole society, and inseparable from the great help of the Embassy in London, the Chinese-funded institutions and the compatriots in Britain." The table tennis athletes Zhang Jike and Li Xiaoxia, badminton athletes Li Xuerui, Zhang Nan and Zhao Yunlei and the Chief Coach for women's individual event for the Chinese national badminton team Tang Xuehua attended the victory party as representatives. 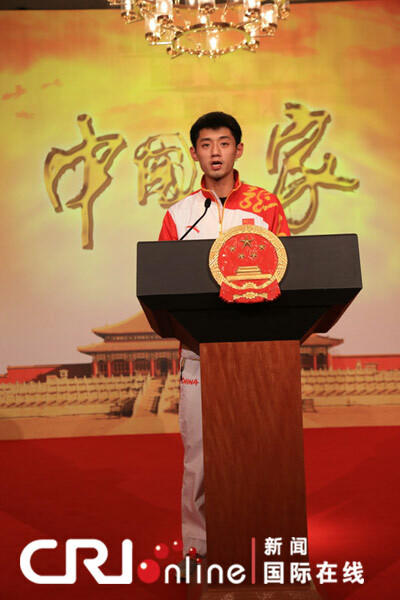 Zhang Jike, the gold medalist for table-tennis men's individual and team events, delivered a speech and talked about his experience in his first Olympic Games. "We arrived at Leeds on 17 July for the pre-competition training and then went to London for the 30th Olympics and achieved great results. During our stay in Britain, we personally experienced the intense and exciting Olympic competitions. And the convenience and safety here made us feel at home. In particular, we could not succeed in the events without the care and help from the Embassy and the warm support from the enthusiastic fans presented. " 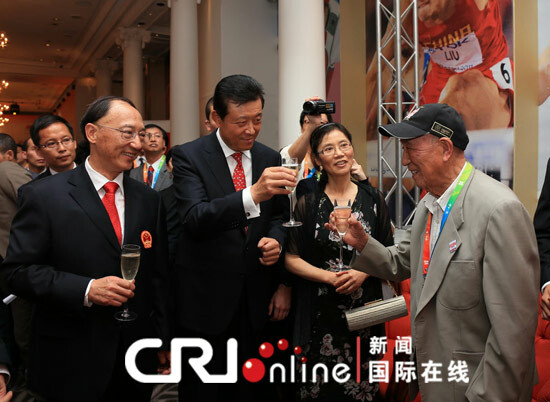 The 88-year-old Wu Chengzhang also attended the victory party. He played basketball for China at the 1948 London Olympic Games. Visiting London again after 64 years, Mr. Wu had a lot of feelings. Wu Chengzhang: "I came here in 1948. So this time I see the changes everywhere in London. It is not the same as before. The size, organization and events of the Olympic Games have all changed. There were not so many events and not so many participating countries. At that time the Chinese team had no gold medal at all. The Chinese did not win a single point before 1948, not to mention a gold medal. My regret is that I watched just one match here, the men's basketball match between China and Britain. I think our Chinese team did not play very well. "